Alice Butler has been receiving some odd messages – all anonymous, all written in code. Are they from someone at PopCo, the profit-hungry corporation she works for? Or from Alice’s long lost father? Or has someone else been on her trail? The solution, she is sure, will involve the code-breaking skills she learned from her grandparents and the key she’s been wearing round her neck since she was ten. 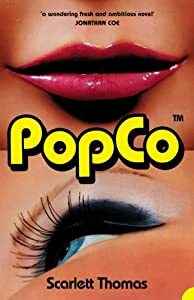 “PopCo” is a grown-up adventure of family secrets, puzzles, big business and the power of numbers. Wow. Just wow. I love, love, loved this book. It’s probably the best I’ve read so far this year. From the synopsis I had been unsure, and in fact almost bought it a few times before finding something I thought sounded better to read . In the end I mainly bought it because I had really enjoyed the End of Mr Y which is by the same author. This is really a book which made me think, about corporations, and things we ignore but encounter every day. It talked of how corporations trick people, and how tose in marketing seem to be worth more than those who actually make products- and that’s just one issue it talks about. It doesn’t feel preachy though, it really does just make you think about things in a different way. It made me interested in alternative medicine, and veganism- and they weren’t even key themes! It wasn’t perfect though. Some of the stuff about codes and maths really went over my head. Although I don’t think it was completely necessary to understand that it would have added something to my enjoyment. There was also a couple of adult scenes which I didn’t think were needed (I didn’t mind them being there though) which might put some people off, but there weren’t as many, or as graphic as in The End of Mr. Y.